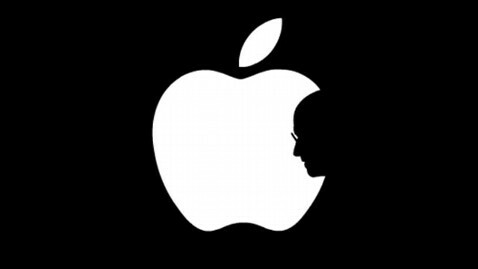 Steve Jobs died yesterday. He was 56 years old. I'm sad he's gone, but so glad he lived. In the book 'I am John Galt', Steve Jobs is being compared with Howard Roark: just inventing because it was so damn cool. Acting only by your opinion, not following or living for others. He was a true pioneer, and I will think of him as a Randian hero. This is a great speech he did in 2005 at the graduation of Stanford University. This, for me, embodies his whole personality, and is exactly the reason that I greatly admire him. One of the greats. He did a lot of good but this is too soon. Huge, huge loss for the world today. Who knows what he might have come up with in the future. I feel as if my favorite author had died - a profound feeling of personal loss. I'm glad to see Amazon.com dedicating part of their homepage to honor Steve. Another world-changer with a rough start in life. So has Google. Good for them. They acknowledge the loss of their most formidable adversary. He is leaving a hole the size of the moon centered on Silicon Valley. This is the first time that I feel sad following the death of a complete stranger. "Steve was very fast thinking and wanted to do things, I wanted to build things. I think Atlas Shrugged was one of his guides in life"
Even though I have been mostly a PC user (I do have 2 iPods), I have long been in awe of the beauty and elegance of his product line, most of which ended up in the New York Museum of Modern Art, maybe the only truly great art in that building. Most of the successful competitors to Apple had to respond to his brilliant vision, in form and function, and all of consumer technology benefitted as a result. And after all of that brilliance and creativity, one of the most elegant things he did was to step down quietly, very shortly before his death, to guarantee a smooth transition to Life-After-Steve-Jobs. I saw his presentation of the NeXT computer, years ago, and it was one of the most brilliant marketing presentations I have ever seen. Such a class act. He will be missed. I hope those he mentored at Apple can continue the innovation. I also saw the NeXT presenation here in New York and agree: it was brilliant. I also agree that Steve Jobs' death is a great loss indeed. Thank-you Mr. Jobs for your life and your life-enhancing work! As a matter of fact, Jobs was planning the adoption by others for years (since he was diagnosed with cancer again in 2008). Gradually transferring his tasks to others, to indeed try to make the adoption as smooth as possible. A very rational decision in my opinion, not evading the truth that he had cancer and was going to die, eventually. 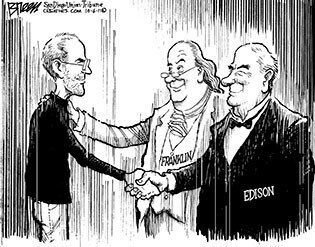 For me, the iPhone release-Keynote is the best (along with the Stanford graduation speech - posted by JohnRgt), Jobs had the very special ability to sell everything to everyone. With enormous enthusiasm he always got everyone along, either if it was an new MacBook or an (I'm not kidding, the crowd went crazy) sock you could put over your iPhone as protection. In my opinion one of the very best in presenting a new product. He has become such an icon, people were very excited before the Keynote had even started, Jobs had that great charisma. Something that Tim Cook (his predecessor) never will have. I think that everyone has to agree when it's said that Jobs changed our world permanently and definitely for the better; a incredible achievement. The world has suffered a great loss. Tim Cook is of course his successor, not his predecessor. Simply beautiful. I love it. Thank you for posting that picture in a bigger size! I, and a lot of my friends, use it as profile picture on Facebook. It seemed that the biographer kept condemning the physics of perfectionism as control issues. Towards the end of the book, he made what struck me as an incredible leap by claiming that Jobs' either-or assessments - everything and everyone was either great or sucked -- stemmed from his perfectionism. I've never worked in the professions. Is American corporate culture such that people expect the sort of leeway that makes pushing to perfect or the seemingly impossible unusual or unacceptable? I understand that there are better, more civil and effective ways of leading one's team to noteworthy heights. But the book constantly links perfectionism to Job's prickly leadership style. No one gets to heights without an almost obsessive outlook in relation to his particular interest. From sports to invention, a singular focus is what leads to achievement. This perfectionism can be a bit much for the people he interacts with, if they don't share his obsession. Of course, such eccentricity does make one "different" from the "norm". Of course his death was inevitable because of his cancer. His eventual death was inevitable but not because of cancer. According to televised reports from the biography, the kind of cancer he had was curable with modern medical care but he chose a bizarre 'alternative medicine' attempt to deal with it through 'diet' and refused the treatment that would have probably cured him. ... It seemed that the biographer kept condemning the physics of perfectionism as control issues. Towards the end of the book, he made what struck me as an incredible leap by claiming that Jobs' either-or assessments - everything and everyone was either great or sucked -- stemmed from his perfectionism. Does the book distinguish between 'perfectionism' as doing things right versus obsession with a personal interest unrelated to the requirements of the stated goal?